Team Third Law’s Kids & Teens Competition Team had their first tournament of 2016, and it was a great success. The Naples BJJ team, including seven kids, two teens and two adults, brought home 12 golds, 5 silver and 5 bronze. Cory, who was competing in his first tournament, won double gold in his gi and no gi intermediate divisions. In no gi he won his first match by reverse guillotine and his second by arm triangle. In gi, he won two matches by points. Tony won one match in his no gi advanced division for silver. Robert, who was in the same weight class and advanced division as Tony, won one fight no gi by kimura for bronze. Robert also got a bronze in his gi advanced division. Tyler won two matches by points in his no gi advanced division for gold. Devon won one match in his gi intermediate division for bronze. Corey won two matches in his gi beginner division by points for silver. Eli won gold in his gi intermediate division, winning his first match by Americana and his second points. He also got bronze in his no gi intermediate division. For the teens, Noah and Andy did both teens and adults divisions. Noah got silver in both his advanced teens divisions. In teens no gi advanced he won one match by kimura and in teens gi advanced he won one match by choke. In adults, Noah won one match in no gi intermediate for gold by points. He also got silver in adult blue belt and bronze in another no gi intermediate division. Andy won two matches by points for gold in the teens no gi advanced 16/17 division. In his gi 16/17 advanced division he won one match by Americana and another by points for gold. In adults, Andy won two matches for gold in no gi intermediate, defeating his first opponent by Americana and his second by points. He also had another no gi intermediate match which he won by points for gold. David, father of Eli, won two matches in no gi for gold, the first by arm triangle and the second points. In gi he also won two for gold. He won his first match by kimura and his second opponent forfeited due to injury. Theresa won gold in her no gi intermediate division, defeating her first opponent by kimura and her second by points. In gi she won one match points for silver. Next up for the adult Naples BJJ competitors is IBJJF’s Atlanta Open and the Abu Dhabi Pro Trials in Orlando. 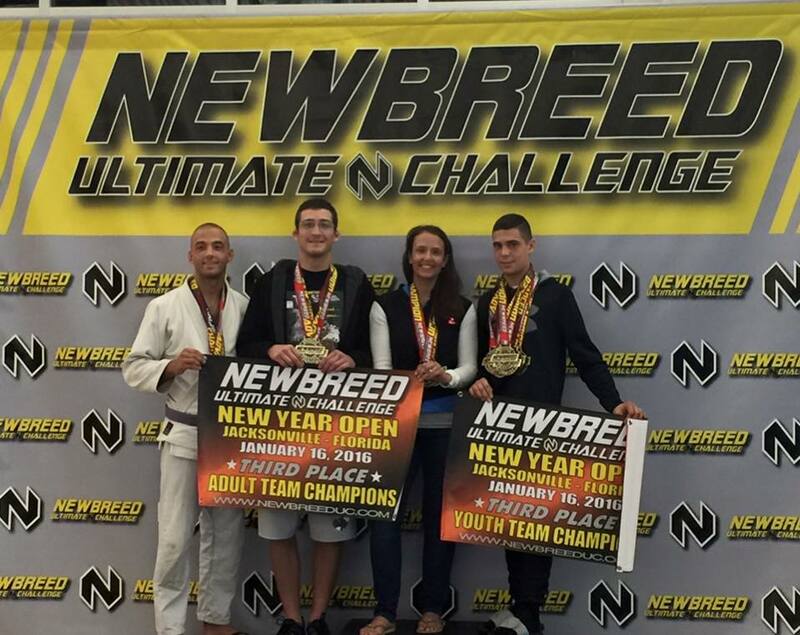 For Andy, a trip to California for Pan Kids is in order, and for the rest of the Naples BJJ kids competition team, a Newbreed in Orlando on March 5. After the competition, the kids and coaches headed to Off The Wall Trampoline Park, and had a blast, jumping on trampolines and playing laser tag. They definitely have the “work hard, play hard” concept down!